Sonja Karadzic was a very familiar presence to those of us who reported the war in Bosnia in the early 1990s. She ran her father Radovan's press centre in his mountain headquarters at Pale, near Sarajevo. You could not move about Serb controlled territory without first getting permission from her. In an exclusive interview with the BBC, she has given the first real insight into how her father will defend himself at the UN's International Criminal Tribunal for the former Yugoslavia (ICTY) at The Hague when his trial begins - probably later this year. 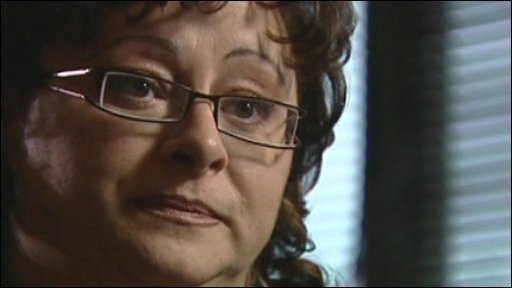 Ms Karadzic told me how she had no contact with her father for five years. She and her mother had begun the legal process in Bosnia to have him declared officially dead. Then, in July last year, a friend telephoned to tell her she had heard on television that her father - the former Bosnian Serb leader, who had led his people in a war to divide Bosnia along ethnic lines - had been arrested in Belgrade. "At that moment, I felt very mixed", she told me as we sat down in a hotel restaurant in Pale, where she still lives. "I was both relieved and afraid. It was five years since we'd been in touch. And now for the first time we knew that he was alive and we'd be able to see him." Her father is accused of multiple acts of genocide, crimes against humanity, extermination, and forced deportation. 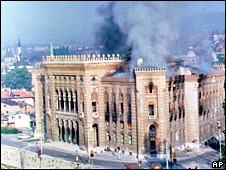 Among the charges he faces is responsibility for the siege and bombardment, by his forces, of Sarajevo. The indictment accuses his men of inflicting terror on the civilian population for 44 months. Sonja Karadzic: Yes I know that is as you say. Allan Little: So do you accept that your father has responsibility for that? SK: No. I can't accept that because I really know - I was there and I worked with him all the time. He can't be responsible for such things. SK: I can't say that. Maybe the process against my father will prove who is. Somebody is. SK: Maybe. Maybe people who did what they did in Srebrenica. Maybe people who were paid to do what they did. Srebrenica is probably the most serious single crime on which Mr Karadzic faces charges. The indictment accuses him of instructing his forces to "create an unbearable situation of total insecurity with no hope of survival". His daughter says he was shocked when he learned, in July 1995, that thousands of Muslim men and boys had been murdered - but that he bears no responsibility. When I asked her about this, she made the extraordinary claim that Bill Clinton, the then US president, bears the main responsibility for what was the worst massacre on European soil since World War II. "Srebrenica is in itself very much a fabricated story - the number of bodies, their gender, who they really were," she told me. "It goes back to 1993, two years before the tragedy. It was determined then that Srebrenica would be the location of a crime, and that there would have to be a minimum of 5,000 victims. That was determined by President Clinton." "It was meant to happen in April 1993, but [former Bosnian President] Alija Izetbegovic said no. So it happened later, in July 1995." "There were eight executioners - their names are well known - as well as those who gave the orders. No charges have been brought against them - that's been disallowed. But Clinton needed a minimum of 5,000 victims to justify Nato making air strikes against the Serbs." 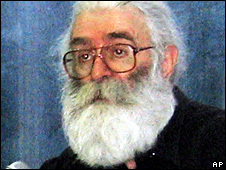 The war Mr Karadzic waged cost about 100,000 lives. His daughter's account gives this insight: that her father will try to persuade the court that he is an innocent man, who fought a just cause, manipulated and betrayed by outside forces much more powerful than himself.